South Sudan’s July 9, 2011 Independence Day is fast approaching, but ongoing violence in Abyei, including the deliberate burning of villages by northern-aligned forces and the displacement of 20,000 people, threatens to undo progress toward peace in Sudan. At this moment, Enough presents an assessment of the current situation and recommendations for a sustainable solution from Douglas H. Johnson. A member of the Abyei Boundaries Commission, Johnson is the author of The Root Causes of Sudan’s Civil Wars, and When Boundaries Become Borders: The Impact of Boundary-making in Southern Sudan’s Frontier Zones. This report reflects the personal views of the author and do not necessarily represent those of the Enough Project. The Abyei area has often been called Sudan’s Kashmir, a territory claimed by two nations. It could more aptly be described as Sudan’s West Bank, where a local population is being progressively dislodged and displaced by government-backed settlements. The Abyei Protocol in the Comprehensive Peace Agreement, or CPA, was supposed to address the root causes of this dispute but has yet to be implemented. Recent fighting in the Abyei area, involving Sudan Armed Forces, or SAF, and allied militias, throws doubt on Khartoum’s commitment to the full and final implementation of the CPA. It demonstrates Khartoum’s willingness to continue limited warfare against the Sudan People’s Liberation Movement/Army, or SPLM/A, along the North-South border and to support the continued dispossession of local populations and their replacement with settler populations allied to the government. of the CPA interim period. • The U.S. government must publicly reaffirm that the ideal solution is the implementation of the referendum provision of the Abyei Protocol, to be carried out within the territory defined by the Permanent Court of Arbitration, or PCA, and according to the terms of the Abyei Referendum Act passed by Sudan’s National Assembly and signed by President Bashir, and insist on Khartoum’s compliance. The referendum can be implemented by the Abyei administration before the end of the dry season (May). 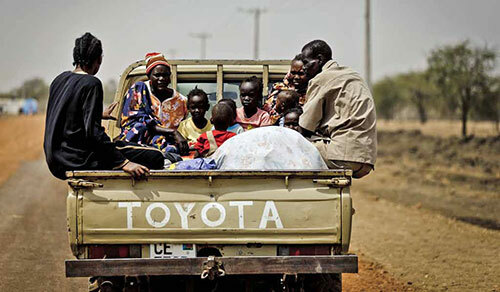 • Any alternative to conducting the referendum must recognize the dominant rights of the Ngok Dinka to the Abyei area and their desire to be part of the administration of South Sudan, and that any Misseriya representation in the administration of seasonal migrations must be based on a recognition of those dominant rights. • The safe return of Abyei’s residents must be carried out by an international peacekeeping and monitoring force prepared to act if opposed by violence. • Short-term provisions and long-term mechanisms must be put in place to enable both the Misseriya and the Ngok to collaborate in secure annual movements of pastoralists through the Abyei area and neighbouring territories.